At Plant Biology 2017, the Biology Learning Objectives, Outreach Materials & Education (BLOOME) awards were the focus of the Education Booth. These grants are awarded on a competitive basis to fund innovative ideas to increase education and outreach projects focusing on plant science literacy. Four previous award winners came to Hawaii to share the products of their labors. 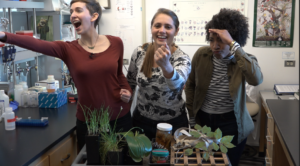 Molly Edwards, a graduate student at Harvard with Elena Kramer, presented Science IRL (in Real Life), a video series available on YouTube, designed to show what being a scientist is like, in real life! Check this series out. Great for students, high school, undergraduates and graduate students and faculty for that matter. It is just super fun. Go Molly! Another graduate student, Katie D’Amico from Ohio State University presented results of the “Plant solution for global problems: brining plant science to life through interactive videoconferencing” project. The project is a collaboration between Erich Grotewold (Ohio State University) and the Center of Science and Industry (COSI) in Columbus, Ohio, to develop short educational videos and an interactive videoconferencing (IVC) program to enhance plant science education for middle and high school students. This program uses online software to virtually connect students across the United States to a PhD student and COSI educator for a one-hour, hands-on program that is aligned to the Next Generation Science Standards. In advance of the program, teachers receive materials that include detailed lesson plans and supplies for all activities. The group also developed four short educational videos including 1) careers in plant sciences, 2) plants as the foundation of our food system, 3) plants as a resource for biofuels and bioproducts, and 4) plants as solutions to global challenges. 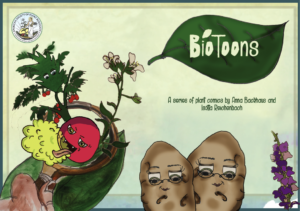 Also at Plant Biology 2017 were two recent undergraduates from University of East Anglia, Anna Backhaus (Biology Sciences) and Isotta Reichenbach (Literature, Drama and Creative Writing) who joined forces to create BioToons, a comic book series about plant biology for 9-12 yr olds. Their aim is to produce comic books that explain cutting-edge research projects to communicate the beauty, complexity and fascination of plant biology to children. The pair work with scientists to bring their research projects to the page, in beautifully illustrated story lines. Complete with costumes, the pair arrived to tell us the stories of migrating tomatoes and heroic Arabidopsis plants, which are just some of the main characters featured in their comics. Last, but not least, Alan Berkowitz (Cary Institute of Ecosystem Studies, NY) presented his work on “School Woodland Ecosystem Study Project”. The project focuses on taking students to the woodlands in their own backyard to explore the tree species. The group works with teachers to develop inquiry-based, exploratory lesson plans that increase student understanding of fundamental concepts like biodiversity. And, of course, there were T-shirts for sale, coloring books, the 12 Principles of Plant Biology, and Wikipedia Edu (“Don’t cite it, write it” https://wikiedu.org) was back again this year! The Education Booth at ASPB; it’s the place to be!